For those of us who’ve never been to the alluring destination, we’ve always heard of the beautiful beaches, the colorful reefs, the warm weather and pristine waters. Maybe you have a Facebook friend who moved to Hawaii and is living the veritable dream, plastering your feed with envy-inducing photos. Maybe you know this one family who spent a week in the bliss of the islands and came back looking unreasonably healthy and happy. Everything you’ve heard? It’s true. It’s paradise. Bright red Slate Pencil Urchins sit on the top of the reef at Molokini Crater off the coast of Maui while Orangespine Unicorn fish shoal in the shallows. Molokini was formed by volcanic ash approximately 230,000 years ago, and now supports a rich coral reef in the waters around it. Hawaii’s legendary ocean life is what drew me to the islands. Tropical Pacific reefs are legendary. Divers who’ve just returned from trips to Pacific reefs glaze over talking about the coral cover, the fish, the sharks, the everything-you’ve-never-seen-before that this diver saw there. They aren’t lying, there is great coral cover, plentiful fish from numerous species, and the chance to encounter sharks, manta rays, or even a humpback whale. If you’re looking, there’s also a very good chance you’ll find fishing gear debris. Hawaii’s waters are filled with humans like your Facebook or tourist family friend, who end up damaging the paradise they’re enjoying. A TIRN volunteer showing a tangle of line that he'd just pulled off the reef. The fishing lines stretch over reefs, diving under mounds and sheets of live coral that have overgrown the hooks and lures, wrapping around and through complex beds of finger corals, hooking under overhangs and disappearing into algae. Marine life, especially Green Sea Turtles and the endangered Hawaiian Monk Seal, often become entangled in this gear, cutting into their skin, leading to infections that can be fatal. The fishing gear is ugly, and this malignant litter is corrupting the reefs that have helped build Hawaii’s pristine marine ecosystems. Luckily, there are people fighting to keep Hawaii healthy and beautiful, and on a recent trip to Maui, I saw them in action. Divers above a coral reef on Molokini crater. on New Year’s Eve as I pulled into roadside parking in Kihei, an area in the south-west of Maui. A short walk down a grassy slope leads to a popular beach, and just beyond lies a rich coral reef. I knew I had found the right people when I caught sight of a group donning wetsuits and retrieving their scissors, wire cutters, and catch-bags from their cars. These volunteers were with Turtle Island Restoration Network (TIRN), a non-profit that has worked globally to help turtles and other marine life and recently opened a program in Hawaii. This group has been cleaning the reefs of Maui since the spring of 2017, when they were united by a mutual desire to help Maui’s ocean life. Although Maui’s green sea turtles are making a comeback, they are still listed as threatened on the US Endangered Species List along with the extremely endangered Hawksbill turtle. One member of TIRN’s reef cleaning program, Anita Wintner, has identified several new hawksbill individuals for a state-wide photo catalog. Wintner has been cleaning reefs for fifteen years with Cheryl King, who is now the Director of TIRN’s Hawaii program. Over the years, King organized a group of snorkelers who helped clean reefs, free entangled turtles, and care for hatchlings. This team would later become a part of TIRN as the reef cleanup volunteer effort. A green sea turtle floats just below the surface in Maui. Minutes before I took this photograph, I witnessed this turtle take a bite of plastic out of passing debris. Although King started as the director of the Hawaii program just this past October, she’s no tourist in Hawaii. King has worked on turtle-related projects since she began working in Hawaii nearly twenty years ago. Currently, one of her focuses is monitoring the sea turtle nesting activities on Lanai, a smaller island off the coast of Maui, almost completely owned by Larry Ellison, the billionaire owner of tech-giant Oracle. King starts as many days as possible with time in the water, usually heading out with the group to clean the reef. On the day I shadowed, we headed out to clean the reefs off of Kamaole Beach, a popular spot for shore fishing and therefore an unfortunately reliable place to find entangled fishing lines. A TIRN volunteer comes up from a dive after cutting away fishing line. It wasn’t hard to find gear littered across the reef. Fishing lines stand out as straight cuts through the complex curves of corals. Free-diving down to cut the lines away from the coral usually led to another set of dives as you followed the gear winding through the coral, often ending in threateningly large hooks. The group laughed that the oversized hooks were wishful thinking on the part of the fishermen, as they were too large to catch anything found on this reef. Hooks caught in the reef may stand a better chance of snagging marine life than they ever did at the end of a cast. The reef itself was relatively healthy, with abundant live coral, several nudibranchs, and a few turtles lazily rowing their way through the water or sleeping under overhangs, eyeing us with apparent disinterest as we passed. However, the volunteers commented on a lack of fish, something they’ve noticed in high-traffic tourist reefs over the years of living on Maui. A TIRN volunteer works to cut fishing line away from coral. About halfway through our expedition, about a hundred yards from shore, we came across a thick wire snaking through the reef. At first there was a ten foot section, which bested our scissors, calling for hardier wire-cutters. Soon we had tracked the wire through fifty yards of reef, cutting as much of the wire out of the reef as we could. Free-diving to remove line is slow work in deeper water, and it took many repeated dives to rid the reef of the wire. In under two hours, the group removed three hundred feet of line, twenty-one fishing weights (over three pounds of lead), twelve hooks and lures, a CD, a sardine tin, fiberglass fragments of a boat hull, and a pair of shorts. They clean this reef once a week. A TIRN volunteer holds out an empty sardine can. While I only saw one day in the life of this reef, the group says this was a below average haul for a day of cleaning. Reefs like Kamaole III receive this staggering amount of fishing gear and debris every week. It’s a “never ending amount of fishing gear” according to Cheryl King. “They could snorkel all day, every day, and never get to everything.” Even so, they have gotten to an astounding amount. For many who become involved with the group, cleaning reefs can be an addicting endeavor--probably a good thing given the magnitude of the problem. During 61 coral reef cleanups between October 2017 and January 2018 all over Maui, the group removed an astounding 22,857 feet of fishing lines -- over four miles. They also removed 1,583 weights totaling 345 pounds, 432 hooks, 571 swivels, 209 leaders, 106 bobbers and lures, and 555 pieces of trash. How much more is left on Maui’s reefs? 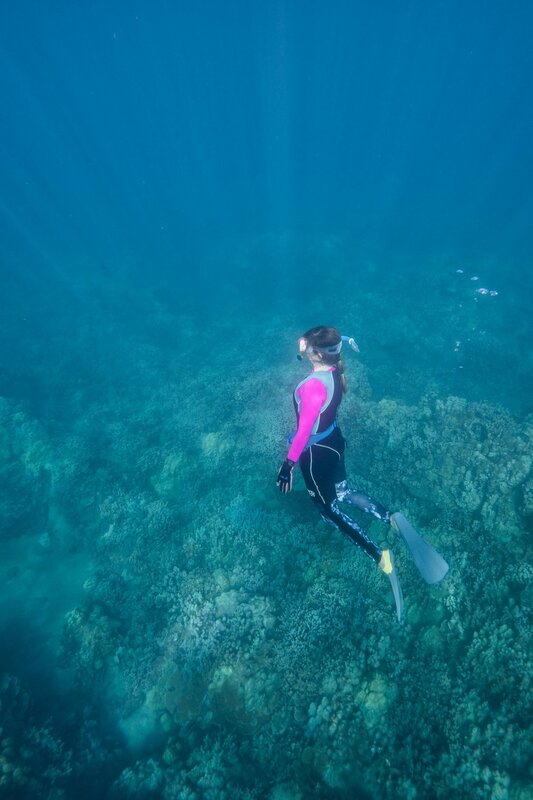 For the volunteers, cleaning the reef is not only helping the environment, but also snorkeling and freediving, hunting for the next line to cut away from the reef. Huge green sea turtles become almost commonplace, swimming out of the blue frequently on each snorkel, coming close to inspect the snorkelers. It also helps that the other people in the water are effusively positive and excited to be there, helping take care of the reefs they’ve come to love. I only met a small portion of the Turtle Island Restoration Network’s Hawaii team the day I went out. If the rest of the group is anything like them, TIRN’s efforts will help Maui’s reefs have a brighter, cleaner future. This story was also published in Alert Diver Magazine in 2018.